Figure 1. Interactions among landowners and scientists. Thickness of arrows represents proportionality of effort or gain for each area. 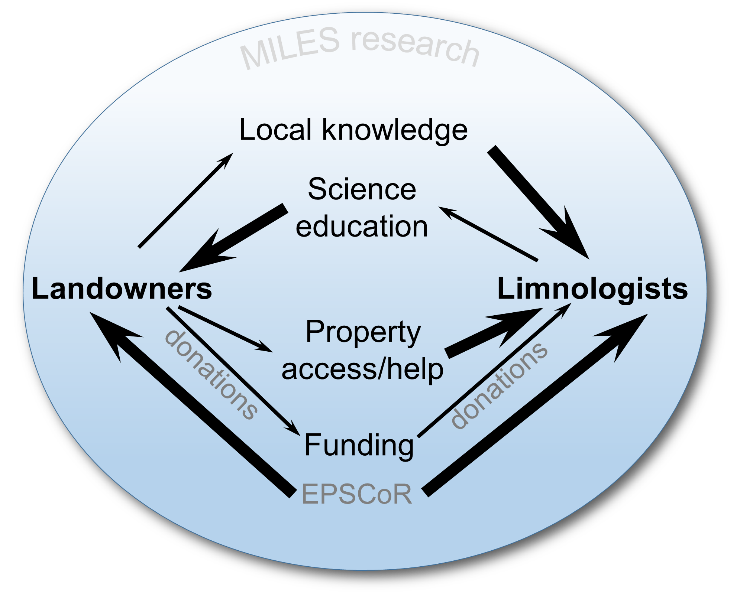 Note how the influx of external funding impacts both limnologists and landowners. Landowners should understand that scientists are highly trained and have a wealth of specialized knowledge. At the same time, scientists must recognize that landowners possess an equal if not greater wealth of knowledge at the local level (Figure 1). A landowner who has lived beside or near a lake for decades can offer a “long view” perspective that a researcher can’t hope to gain from sampling over a relatively short period, even several years. Melding these two knowledge bases can benefit all involved and move science forward to help our natural ecosystems. We arrived at Fernan Lake as part of a pilot project for the University of Idaho’s participation in the MILES (Managing Idaho’s Landscapes for Ecosystem Services) program. MILES is one component of a multi-year National Science Foundation grant under the Experimental Program to Stimulate Competitive Research (EPSCoR) program. 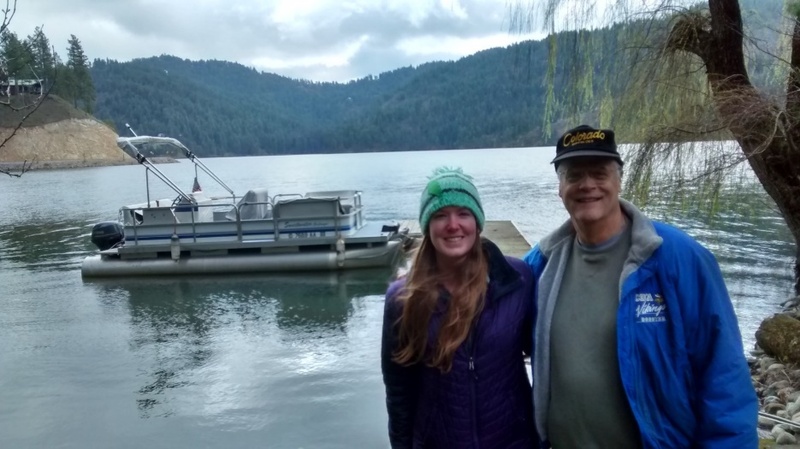 The ultimate goal is to discover ways to manage ecosystem services sustainably across Idaho; the University of Idaho is focusing particularly on Lake Coeur D’Alene and the surrounding ecosystem. An underlying driver of our research was the program’s need for basic high-resolution limnology data (nutrient mass-balance). Getting this data was critical for our study, but would also benefit the local community. Fernan Lake is a small lake (154 ha, 5.1 m mean depth) in the Panhandle of northern Idaho, just outside the City of Coeur D’Alene. It typically suffers toxic blooms of cyanobacteria in summer and fall that decrease the lake’s aesthetic and recreational value. The keen interest of the Fernan Lake landowners and surrounding community in improving its water quality made them receptive to engaging with scientists interested in the lake. We, in turn, recognized that the community could provide us with valuable knowledge, and access to properties and the lake. Figure 2. Bill Miller, an involved landowner and volunteer lake monitor, and senior author Trea LaCroix. Photo by Marie Pengilly. For example, lakeside resident and volunteer lake monitor Bill Miller (Figure 2), has collected a variety of limnological data for a long time. His records were highly valuable to us, as was his willingness to take us out on his boat every two weeks, and share his insights about the lake. Several other landowners allowed us to place expensive samplers and scientific gear on their properties, keeping it out of harm’s way. As well, members of the community often stopped by when they saw us at samplers to check how things were going. Sometimes they attached comics to our sampling boxes that we found the next field day. We developed a good relationship. Because the community is keenly interested in finding a solution to their problem, they were willing to learn. This is where we excel. Although engaging with the public can be daunting for scientists who are more familiar with beakers and data sondes, it is important to share knowledge. We used meetings to which we were invited to share our results and explain how Fernan — and lakes in general — function. In essence we gave mini-limnology lessons. By participating when invited, and listening with interest to what landowners had to say, we fostered a positive and non-threatening atmosphere at meetings – and were amazed at what we learned. We also included Bill’s data in presentations, which allowed him to see the fruits of his labor and demonstrated the value of collecting data over the long term. As scientists, we cannot emphasize enough the importance of long-term data – even though it may be some time before those data are used. If you are a volunteer monitor, don’t become discouraged if your data are not immediately used – keep at it! 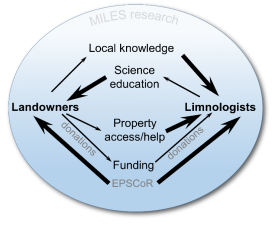 When you look at Figure 1 showing the interactions between landowners and scientists, you may not at first notice the thick solid arrows from “EPSCoR funding” showing its influence on our undertakings and relationships that formed. Fundamentally, science is an expensive undertaking. EPSCoR paid for some of our equipment, travel between the university and Fernan Lake, some analysis of samples, and also footed the bill for Trea’s salary and graduate school expenses. If scientists don’t have funding, they might be able to come talk to your group, but don’t expect them to undertake a large project. So how do you get something started on your lake? Get to know staff at your local agency or form a relationship with a scientist. They often know where there’s funding. Furthermore, having established relationships gives you an advantage when you are competing for funding with a short turn-around time; often opportunities are missed because of the lack of connections. By being engaged with the community, participating in their meetings and answering questions in a straightforward manner, we saw the conversation shift from trying to place blame to moving forward together to solve a pressing problem. In addition, this collaboration helped train a graduate student in presenting data to the public and maintaining and respecting key relationships with landowners.